Removes heat to counteract toxicity. Eliminates eruption and sores. 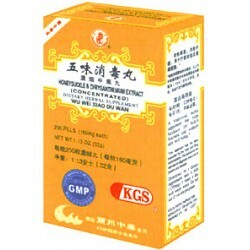 A strong antiviral for relief from herpes. Use for early stage carbuncles, shingles, furuncles with hard base, fever, sores and abscess with redness and swelling that manifests a red tongue with yellow coating and rapid pulse. Ingredients: Japanese honeysuckle, Chrysanthemum, Dandelion, Tokyo Violet, Begonia.